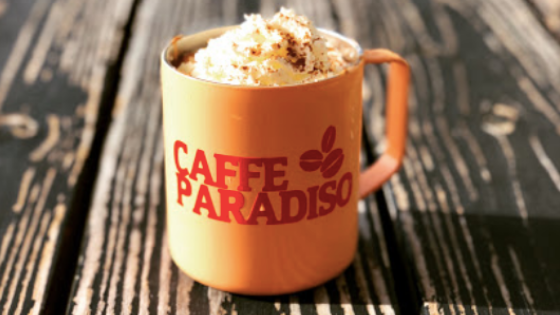 Kayla Lendon, owner of Caffe Paradiso in Vicksburg, Mississippi uses joe in creative ways to showcase new food and drink offerings, boost business when it's slow, and engage customers and provide exceptional service. We asked Kayla to share a bit about what has made her so shop so successful using joe and she was kind enough to oblige. Q: How long have you been in the coffee business and what got you started? My parents are entrepreneurs. They had an opportunity to buy a local small coffee shop that was about to close. We all sat down, looked at the numbers and saw where I could expand the menu, change things up a bit and take the risk. I worked at Starbucks for awhile and saw the tremendous opportunity for me to go out on my own. I took the leap of faith and I've been busy making coffee for the past three years, 7 days a week. I've grown the business organically and am extremely proud for keeping profit as we've grown. Q: What made you decide to try out joe? We try to stay ahead of the competition. Almost everyone has a cell phone. We knew in order to expand, we needed to start the mobile app. In our tech world, People want fast, easy and efficient service. That is exactly what this app gives them. The app is user friendly not only for us but the customer too! A win-win! Q: Was there anything that you were nervous about when launched the app? How did it turn out? We were extremely nervous 1. people wouldn't download it 2. they wouldn't use it. Our fears were soon put to rest. We had several orders the first day...huge success! Our customers love it and they are continuing to use it. Q: When an order comes in, how do you manage that with your in-person customers? 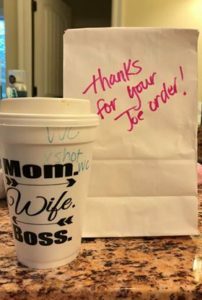 We have a special "Joe" pick up are just for them. Also, when the phone rings and we get a Joe order, We all yell "JOE ORDER" it gets people asking- "what's Joe?" Q: What have customers said about the experience? They love it! It cuts down on wait time, they send us notes and say, "Best thing Ever!" Q: What has been your most successful way of promoting the app and your new ability to accept mobile orders? We love using videos to show everyone how easy the app is to use. 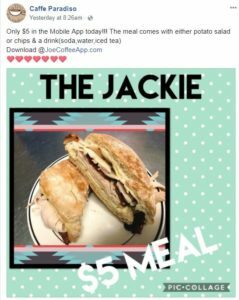 Also, daily in our posts, we encourage people to download and try it by offering something free or making exclusive deals if they order in the app. It's a great way to drum up business and make our business more efficient.